Brian Hook, special representative for Iran, speaks about the creation of the Iran Action Group at the State Department, in Washington, Aug. 16, 2018. The Trump administration's new special representative for Iran says his team will focus most of its work on changing Tehran's behavior on issues of nuclear weapons, terrorism and detention of Americans. Brian Hook was speaking Thursday at the State Department, where U.S. Secretary of State Mike Pompeo announced Hook's appointment to the role that heads a new U.S. team known as the Iran Action Group. Hook said the group would work to pursue changes in 12 aspects of Iran's behavior as outlined by Pompeo in May. He said the issues of Iran's alleged pursuit of nuclear weapons, its perceived support for terrorism and what he called its arbitrary detention of Americans would get most of his team's attention. Hook, who had been the State Department's director of policy planning since February 2017, said the Iran group would begin with several permanent personnel, and that additional experts would be detailed to it later. In introducing Hook, Pompeo told reporters the Trump administration hoped it could reach a new agreement with Iran "one day soon." "But we must see major changes in the [Iranian] regime's behavior, both inside and outside of its borders," Pompeo said. In May, President Donald Trump withdrew the U.S. from a 2015 deal that the United States and five other world powers signed with Iran regarding its nuclear program. 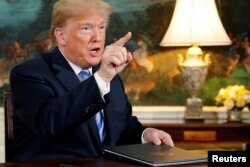 Trump said the deal did not do enough to curb what he and U.S. allies have said are "malign" Iranian behaviors, such as its support for militant groups in the Middle East and development of ballistic missiles. He also ordered a phased reimposition of U.S. financial sanctions against Iran — sanctions that had been suspended under the 2015 deal. FILE - U.S. President Donald Trump speaks to reporters after signing a proclamation declaring his intention to withdraw from the Iran nuclear agreement in the Diplomatic Room at the White House in Washington, May 8, 2018. Trump later offered to speak with Iranian leaders without preconditions in the hope of securing a new U.S.-Iranian deal. Iranian leaders have rejected the idea, saying the U.S. first must scrap the reimposition of the sanctions. "If the Iranian regime demonstrates a commitment to make fundamental changes in its behavior, the president is prepared to engage in dialogue in order to find solutions," Hook said. "But sanctions relief, re-establishment of full diplomatic and commercial relations with the U.S. and economic cooperation with the U.S. can only begin after we see the Iranian regime is serious about changing its behavior." Asked by a reporter if his call for an Iranian commitment to change behavior represented a condition for engaging in dialogue, Hook said the president's offer of talks and the U.S. maximum economic pressure campaign against Iran were "parallel tracks" of the Trump administration's policy. The U.S. reintroduced a first set of financial sanctions on Iran earlier this month and is due to reimpose a second, tougher set of sanctions targeting Iran's oil exports and central bank in November. Hook reiterated the U.S. call on all nations to reduce any purchases of Iranian oil to zero by November 4 — a move that would deny Iran a key source of revenue. He also issued a warning to governments that do not comply. "In our sanctions regime, we are prepared to impose secondary sanctions on other governments that continue this sort of trade with Iran," Hook said.